Twin robotic arms work together as part of a project to construct what will be the largest, most complex object ever 3-D printed in titanium: a test version of the 3-m diameter 'optic bench' at the heart of ESA's Athena X-ray observatory. 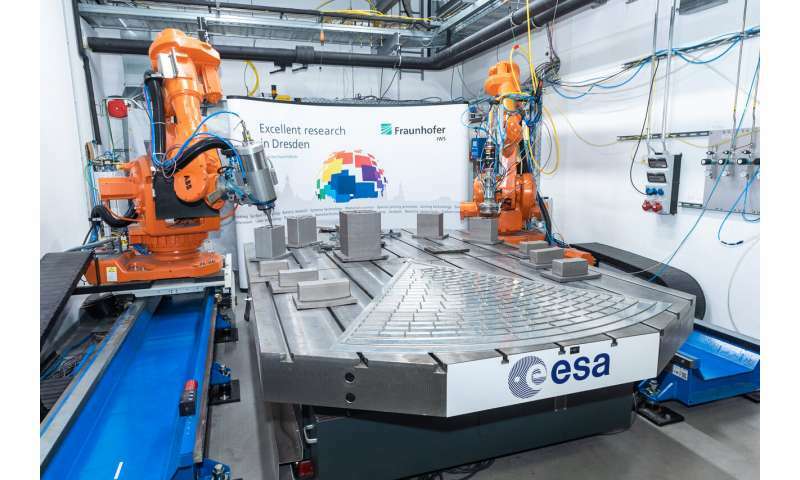 "ESA has teamed up with Germany's Fraunhofer Institute for Material and Beam Technology for this exploratory activity," explains ESA materials and processes engineer Johannes Gumpinger. "The final design of Athena's optic bench is still to be decided, but if it will be built in titanium then its size and complexity is such that it could not be built in any other way." Due to launch in 2031, ESA's Athena mission will probe 10 to 100 times deeper into the cosmos than previous X-ray missions, to observe the very hottest, high-energy celestial objects. The mission requires entirely new X-ray optics technology, with stacks of 'mirror modules' arranged carefully to capture and focus high-energy X-rays. "The optic bench's complexity requires each addition to be milled immediately after printing," comments André Seidel, overseeing the project at the Fraunhofer Institute for Material and Beam Technology. "Any subsequent modification could risk introducing contamination, weakening the space-quality titanium. "Similarly, the entire process has been designed to minimise any risk of contamination. The titanium powder is swept into the laser using the noble gas argon that also prevents any contamination with air. And the milling tool is kept cool using liquid carbon dioxide that evaporates as it warms up, preventing any harmful deposition on the freshly-laid metal surface." "It will be a huge task, taking a lot of time and energy," adds Johannes. "But if we manage it, it will be the largest titanium object ever 3-D printed – and the process will be available to manufacture other large parts, potentially in other metals." The project is being supported through ESA's Technology Development Element as part of the Agency's Advanced Manufacturing initiative, harnessing novel materials and processes for the space sector. Last month more than 150 experts from all across Europe met at ESA's technical heart in the Netherlands to share the latest results from ESA Advanced Manufacturing projects covering topics including 3-D printing and the latest composite materials as well as friction stir-welding.